Having worked with University College Birmingham for many years, we were delighted to be asked to design a campaign to encourage their students to complete the National Student Satisfaction survey. The campaign needed to be bold and eye catching. 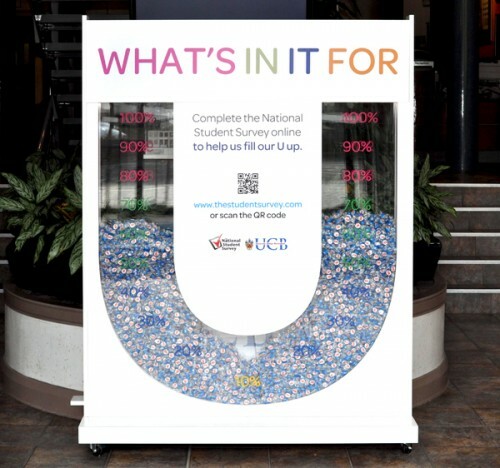 We created the intriguing strapline – ‘What’s in it for U’ – which played on the existing use of the ‘U’ and helped to grab students attention– this campaign was applied to posters, flyers and pop ups across the campus. We also designed and produced a life size ‘U’ to go into the reception area which was to be filled with sweets helping to visualise how many students were completing the survey and how close the University was to achieving their target. The University have had the best response ever in terms of numbers completing the survey this year.